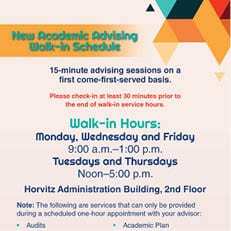 A chance for EdD students to meet fellow students, Dr. Susan Forbes, and the Alumni Panel to ask questions, get advice, make contacts, etc. Managing Change and Life Transitions, Celebrating Success! RSVP to sajax@nova.edu or call (904) 245-8927 by Friday, Mar. 1, 2019. Broadcast Live on the Big Screen at NSU Jacksonville Campus (6675 Corporate Center Pkwy, Jacksonville 32216). Are you looking to improve your grant writing and grant development skills? 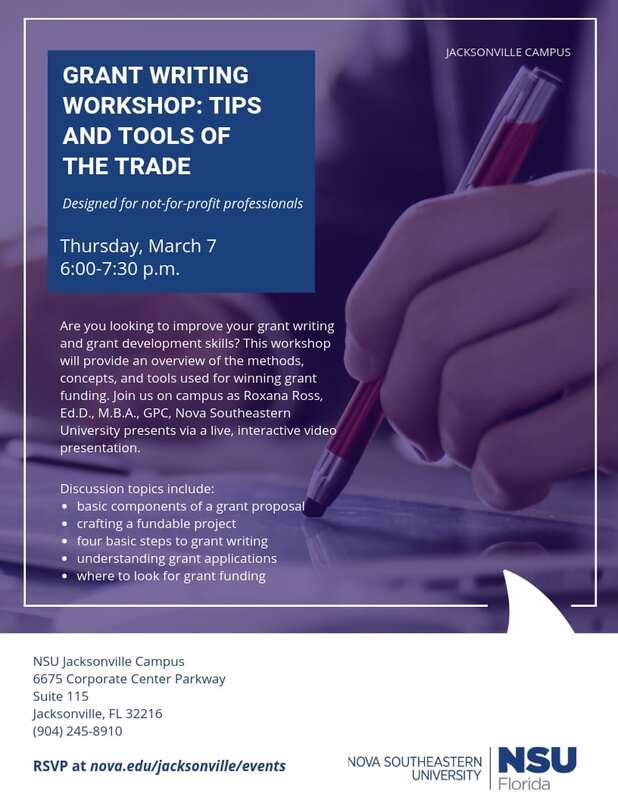 This workshop will provide your an overview of the methods, concepts, and tools used for writing grant funding. Join us on campus as Roxana Ross, Ed.D., M.B.A., GPC, NSU presents via a live, interactive session. Food Provided! Please RSVP to sajax@nova.edu by Tuesday, March 5, 2019. Admission lasts from 9:00 a.m. – 5:00 p.m.
Also includes private barbecue lunch at 12:00 p.m., train ride tickets, giveaways, and a visit from a zookeeper and animal! 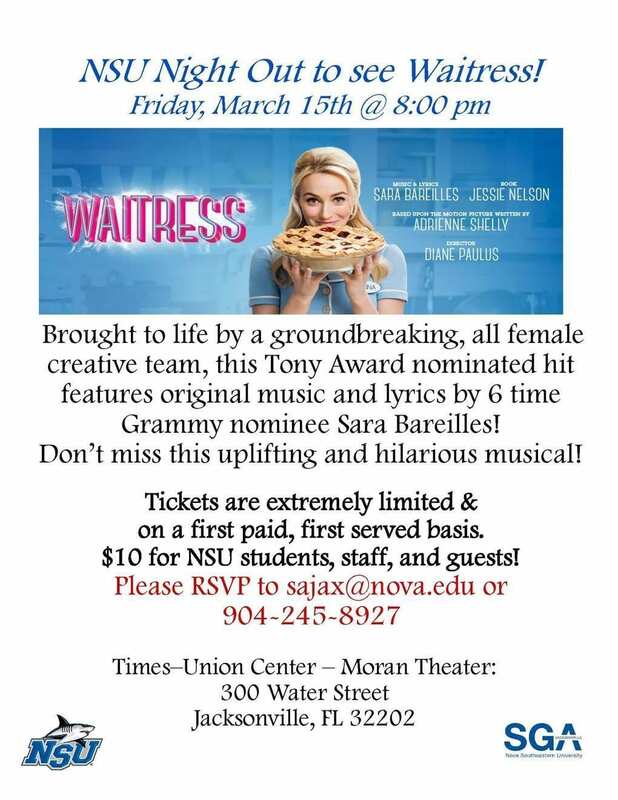 Tickets are FREE for NSU students and staff! Invite guests at only $10 for adult guests & $5 for children (ages 3-12). Under 3 years old are free. Space is limited, so RSVP to sajax@nova.edu or (904) 245-8927 by March 4, 2019. 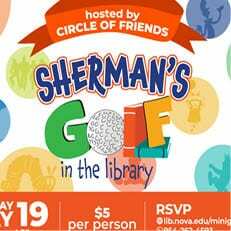 Join fellow NSU students and staff! Brought to life by a groundbreaking, all female creative team, this Tony Award nominated hit features original music and lyrics by 6 time Granny nominee Sara Bareilles! Don’t miss this uplifting and hilarious musical! Tickets are limited & on a first paid, first served basis. 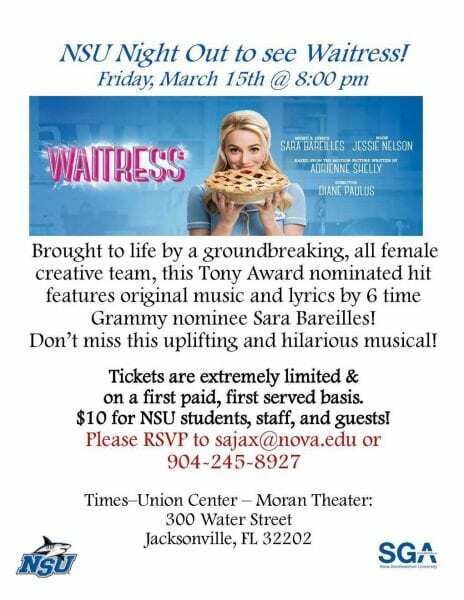 $10 for NSU students & staff, and guests! 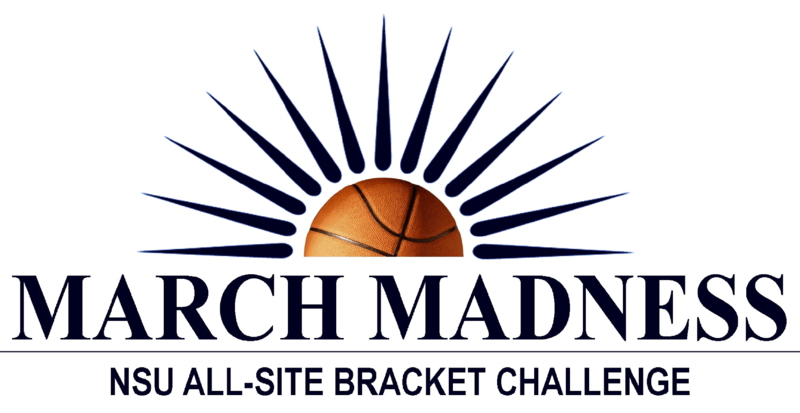 Play against fellow NSU Jax online and onsite Students, and compete against students from all 7 Regional Campuses! 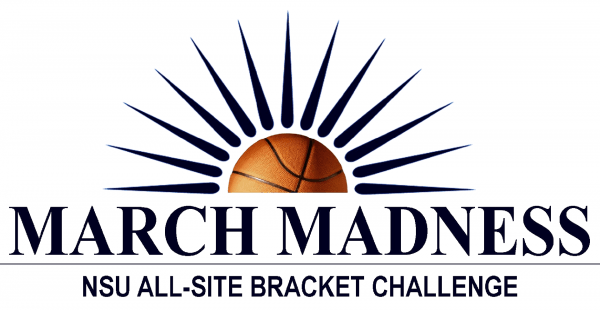 A link to the bracket will be sent to your mynsu.nova.edu emails after Selection Sunday on March 17, 2019 – Brackets Due 12:00 p.m. March 21, 2019. “To Tell Me ‘NO’, Is MY Motivation! !” Presented by: Shevonica M. Howell, Ed.S., M.B.A. nack to present at NSU for a third time, and fresh off of her presentation at the Ignite Jacksonville Conference! Shevonica M. Howell is a former NSU SGA VP, a two-time NSU Graduate, Army Veteran, Author, Motivational Speaker, College Dean & Business Department Chair and Private School Founder that believes each of us are destined for greatness! Notably, she won $15K in the 2014 Citi Salutes business plan competition and has participated in more than 70 speaking engagements since 2010. FREE LUNCH IS PROVIDED! Please RSVP by March 21 at sajax@nova.edu or (904) 245-8927. “You Are Worthy Prom Dress Drive for Camden County” Bring your gently used or new formal dresses, men’s suits/formal wear, shoes and accessories. Drop donations off at the NSU front desk or hang in the first floor student lounge!! “Annual Easter Basket Drive for the Daniel Foundation” For boys and girls ages 5-17 we are needing pre-wrapped Easter baskets, or items such as books, candy, toys, holiday goodies, school supplies, etc. For teens and young adults ages 15-21, we are needing small laundry baskets, and toiletries, non-perishable foods, kitchen supplies, towels, etc. You can drop off donations at the NSU front desk or first floor student lounge!! “Blood Drive and Bake Sale at NSU Jax” – Come support the NSU Jax PA Class of 2020 at their blood drive, and/or bake sale for their medical mission trip to the Dominican Republic. 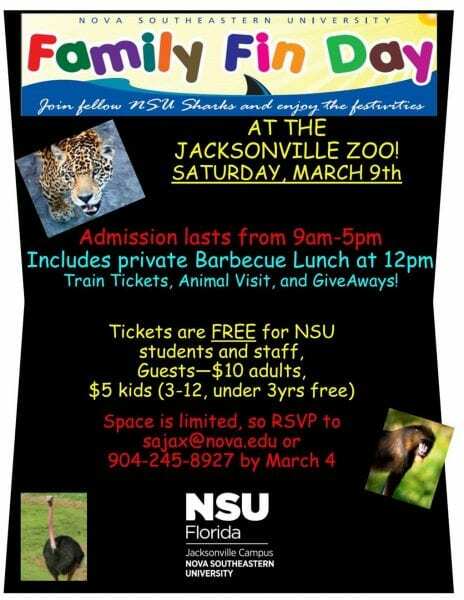 “Fundraiser for NSU Jax’s Relay for Life Team!! 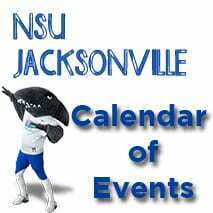 !” – Assist the NSU Jax chapter of Sharks With a Purpose by purchasing an NSU and shark-themed trinket, or energy drinks/bars, with all proceeds going to the NSU Jax Team for Relay for Life!